We have a fantastic line up of amazing classes and workshops. Whether you are looking to chill out, grow as a person, let out your inner creativity or brush up on your business skills we have an event for you. Monday 26th - Wednesday 28th of March 2018. Nicole Lee is an internationally accredited Qigong Teacher, Meditation Facilitator and Natural Health Consultant. She offers classes, sessions and programs that develop mindfulness through conscious movement and stillness utilizing the practice of Integrative Qigong. Qigong is more than exercise, it's a healing discipline for the body. It is a unique combination of movement, breath and meditation that improves the functioning of virtually all of the systems of the body and has both preventative and curative effects. Traditional qigong is an Eastern self healing practice, originating from China and dating back over 4,000 years. Qigong enables the cultivation of energy, vitality and relaxation and it delivers a wide range of physical and mental health benefits. Effectively it is a moving meditation that explores acupressure, slow stretches, gentle flowing movements and mindfulness, the style is modern and integrative and it brings together traditional qigong, tai chi and daoyin yoga. During practice we focus and anchor our attention on the breath and the body, and we use the meditative techniques of intention and visualisation to support the mind. Jenny De Lacy from Video Works with Jenny is the confidence kick-starter for businesses to successfully implement video marketing, to grow their people, their profile and their profit. After a 25 year career as an L&D Consultant, creating audience-focused programs, and powerful presentations to develop tens of thousands of people, she brings the system and strategy needed to make video marketing effortless, simple and NOT scary. Rejecting random acts of video, and needing an effortless system to follow to grow her business, Jenny developed Lights Camera Lipstick – a five-step system that makes adding video marketing simple and easy to implement in any type of business, and do it like a star. Helen Bolger-Harris specialises in supporting creative and spiritual women in business to create more focus, flexibility, flow and ultimately freedom in their lives, so they can do more and be more…on their terms. Following an initial clinical career in the health sector, Helen moved into the corporate world. However, over time, she yearned for more freedom and self-expression and realised that this would be best achieved by her starting her own business as an Authentic Productivity Coach and Intuitive Healer. Being both creative and spiritual, whilst also having a grounding in more structured ‘left-brain’ thinking, Helen blends the strengths of both these worlds to create a unique and impactful approach for clients based on her own successful journey to balance. If you’re in business, and ultimately in life, you’re sure to have suffered overwhelm before. For some of us, it’s an all too frequent visitor which can be paralysing and hard to show the door to. Emotional Freedom Technique (EFT) or ‘tapping’ as it’s commonly known, is an effective way to manage overwhelm and get back into your flow again. In my hands-on (literally!) workshop, you’ll learn what EFT is if you’re not familiar with it already, and you’ll get to practice the basic technique. Then, we’ll explore how you can use it to manage the emotions that come up when you’re in overwhelm, so you can prevent, or manage it, in the future. Angela Sorpreso Bellaartista is the creative founder of BellaArtista Designs - Creative Resin 3D Art Workshops. She runs a Melbourne-based design studio and loves to deliver visually stunning and unique tactile statement pieces to art lovers around Australia. She also loves giving back by teaching her passion of the arts in her ‘Creative (3D) Resin Workshops’ this allows her to educate individuals on how to ‘Unleash Their Own Creativity’ that they thought they didn’t have. In this class you will have the opportunity to create a piece of art that is different and unique, you won’t be painting on canvas but trying something extremely unique and amazing. Learn what tactile (3D) resin art is all about. Come and have some fun whilst using your hands to create something magical to display in your home. Give yourself some "you time" and connect with the inner creative you. You will feel like an artist even if you have never dabbled with art, you will experience, inspiration, motivation, and creativity. Simon Sultana was first introduced into Martial Arts a the age of 15. He began learning Shukokai Karate in 2000 and soon found himself learning Bushidokan (Hybrid MMA Style) an Kali. He became a well respected ISKA tournament competitor earning not one, but FOUR 2nd Place trophies in State Competition for sparring and self-defence events. 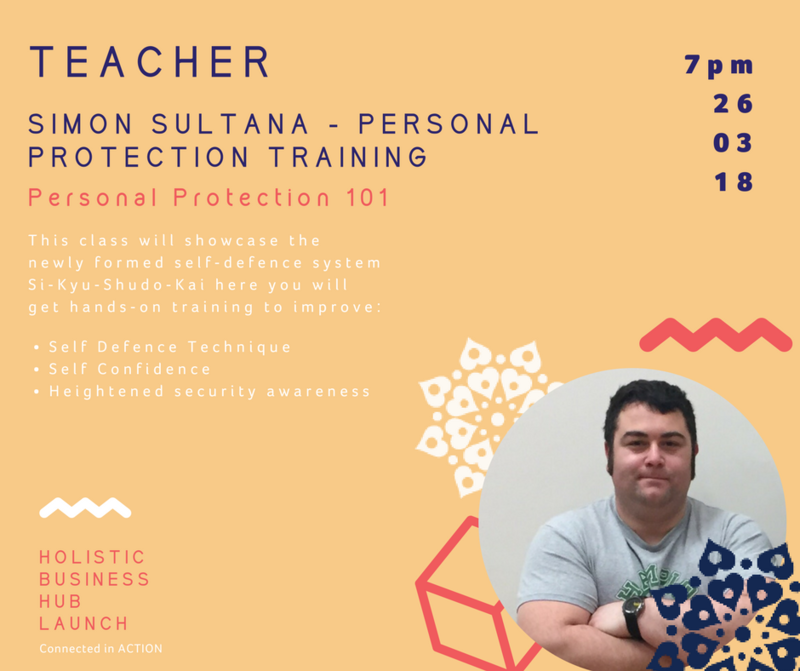 Simon also has earned his Level 3 Basic Instructor Certificate in Pacific Archipelago Combatives encompassing elements of Stick, Knife, Sinawali Boxing, Silat, Jiu Jitsu and Jungle Fighting. It is only in recent times has made the switch to Wing Chun Kung Fu. Simon loves the traditional elements of his newfound Kung Fu training and has felt that it has given his style of Si-Kyu-Shudo-Kai that little bit of flair as well as much needed heart. Lola will take you on a gentle guided sound healing meditation journey, where you will experience deep relaxation, clarity of mind a rejuvenated body. Cassy Ieraci has been a florist and has loved what she does for over 20 years. She began with a floristry apprenticeship in 1997 and has worked in over eight florist shops around Melbourne learning as much as she can. The highlights of her career have been entering floristry competitions demonstrating for Interflora and being a part of the International Melbourne Flower and Garden show. Now she has the pleasure of running Flowers by Cassy. In this hand-tied bouquet presentation by Cassy, you will learn how to prepare and look after flowers. As well as flower choices for different applications, construction methods, sundries, and tools used. During the presentation you will get to ask questions and practice wiring techniques making your own buttonhole, mini corsage or hair flowers to take home. Ashleigh Alsadie (formally Hoult) Is known as the Cold Calling Queen, Professional Speaker and Sales Strategist Ashleigh is the Founder and Director of Melbourne-based sales and marketing firm The PromoDonna. The business creates high quality B2B sales leads and meetings through cold calling and prequalification for their clients. Ashleigh has a passion for training both individuals and organisations, showing them just how to optimise their success during their business development and selling time. Her training uses tried and tested strategies used by her team, along with NLP tactics and method acting skills to create the 'sales persona' they have always dreamed of playing. During ‘Overcoming Your Fear of The Phone’, Ashleigh will show you just how to master the psychology of selling so that you can take your business to the next level in 2018! ‘Overcoming Your Fear of The Phone’ takes you through topics such as Developing A Clear Sales Model (as without one, you won’t be able to close); as well as utilising Neuro-Linguistics Programming techniques to overcome your fear of selling or lack of confidence in this area. Gary Wohlman is founder and director of Amber Phoenix. He is an innovative, international presentation coach who travels the world training CEOs, managing directors, senior managers and executive committees of leading organisations, as well as professional speakers and entrepreneurs in a wide range of industries. His streamlined approach to facilitating personal and corporate communication breakthroughs combines over 40 years of performance-based leadership training, team-building and platform skills. 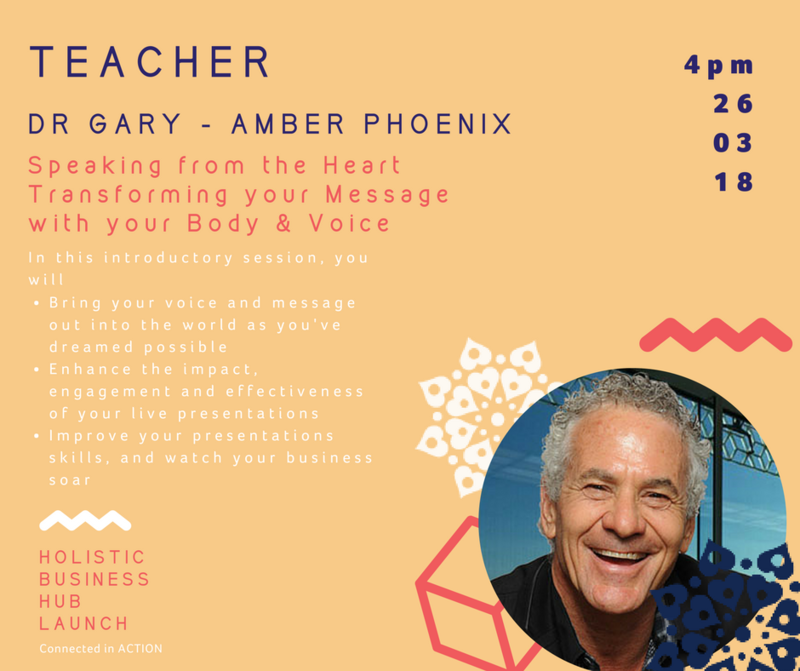 Known for his refreshing, outrageously playful and sensitive audience-participatory style, Dr Gary has an extraordinary ability in creating a safe and supportive atmosphere through which participants easily awaken their authenticity and generate rapport. His key strength is assisting people to unlock their true selves and speak from the heart, on all stages of their life. In this introductory session, participants will have hands-on opportunities in a scenario-based format to swiftly move through challenges in presenting themselves with ease, authenticity, and liberating natural gifts of creative expression. Sarasvati Sally Dawson from has been practicing Yoga since 1996 and teaching Yoga and Meditation since she founded Waverley Yoga Studio in her lounge-room in suburban Melbourne in 2002. Before that she trained and worked a Medical Scientist for 20 years, earned a Graduate Diploma in Business Administration and trained as Yoga teacher with the Australian College of Classical Yoga in 2001. She is a Senior Member of Yoga Australia, and member of Meditation Australia. She is involved in many aspects of the Yoga teacher-training program at ACCY, including teaching anatomy, asana and Yoga wisdom. Sarasvati has developed a number of post-graduate workshops for Yoga teachers, and also teaches a variety of workshops for ongoing students of Yoga and Meditation. As well as her ongoing classes, she has taught Yoga and Meditation in various settings, including the corporate sector and on many Yoga retreats with her teacher Swami Shantananda. Sarasvati offers transformative insights to assist YOU to find true freedom and bliss. She is the author of 'Yoga off the mat, freedom in everyday life'. In this class we will practice deep restorative letting-go, we will then warm up the body and slow flow through a series of yoga postures to stretch and strengthen the body and focus and quieten the mind. There will be options throughout the class to suit different needs. We will finish with a short meditation. Jerry Penny - known as The Nurture Queen by The CARM Group, is a passionate business owner whose passion lies with relationship and nurture marketing. She is also a video making junkie and loves to teach people how to use video correctly on social media. It's not going anywhere, so embrace it! Jerry's background in marketing communications and her creative flair and love of good customer service makes her the ideal person to teach you the ins and outs of video marketing. To learn how you can make your own videos and learn the tricks to making them really pop! From editing, to captioning, to adding music, pictures and splicing videos together. If you have a mac bring it along, to use iMovie, otherwise you can learn the basic techniques using what programs you have. Kleo Merrick is a successful business owner, speaker, and adviser to businesses and startups. Her audience stretches all across Australian and has been described as “Energetic”, “Inspiring” and “Humorous”.Her personality is infectious and combined with her love of events and online marketing, will captivate an audience quickly and easily. 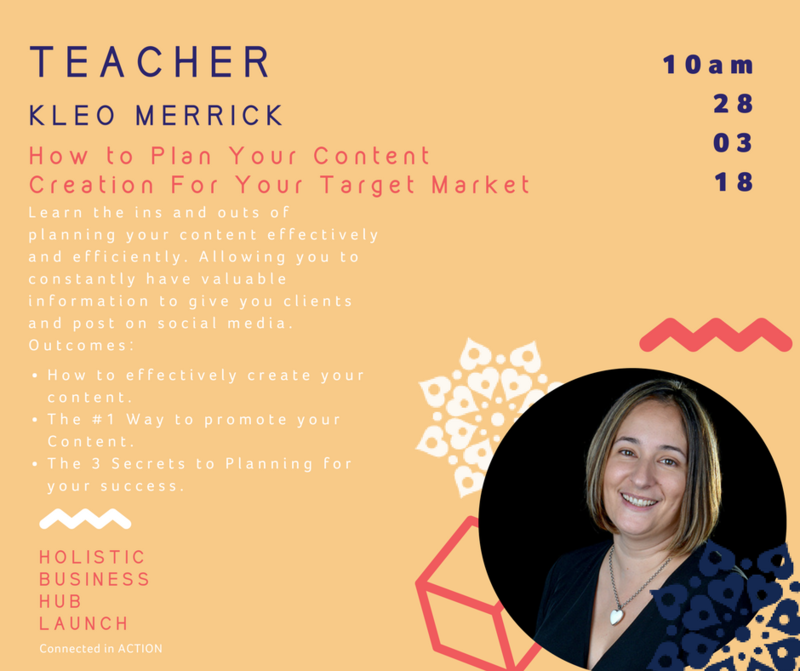 In this workshop' "How to Plan Your Content Creation For Your Target Market’ Kleo will teach us the ins and outs of planning your content effectively and efficiently. Allowing us to constantly have valuable information to give our clients and post on social media. 1. How to effectively create your content. 2. The #1 Way to promote your content. 3. The 3 Secrets to Planning for your success. Kitty Cheng - Transform & Grow Rich was born in Hong Kong and immigrated to Melbourne when she was fourteen. Because of her and her father's health issues, Kitty was inspired to study Nutrition, Health Coaching, and Psychology, which further lead her to be a lifestyle coach. Kitty's life goal is to facilitate people to transform and grow in life's major areas: spiritual life, relationships, personal development, wealth through health. Kitty published her first book "Juggling Health & Wealth - How to Keep All Your Balls in the Air Successfully." She is now dedicated to making a difference and adding value to business owners and professional people, by helping them to understand how they can life a happy, healthy and fulfilled life. In Kitty's workshop: Discover Your Love Language you will come to understand that love can be expressed and received in different languages. Are you aware that there are five love languages? Your love language profile will explain what yours is, what it means, and how you can use it to connect with others, both personally & professionally. Teresa Brandau-Stranks is a qualified and experienced Career Manager & LinkedIn Strategist with over 10 years of experience in preparing professional resumes, online profiles, address of selection criteria and interview coaching services to her clients. Her specialities include online profiles for business and personal use. She is qualified Career Development Practitioner with a GradDip (CD), GradCert (CD) and DipAppSocSc with experience in providing outplacement and training services to unemployed and retrenched workers. She started utilising LinkedIn for her clients over 6 years ago and has grown her business by using this amazing network to connect with high income earners, that are time poor and needing her services. In her workshop, Teresa will cover tips and strategies to use LinkedIn as your online network to find new connections and new clients. Why telling your story is so important and how keywords and interactivity are vital for a successful LinkedIn strategy. Anna Osherov - Holistic Business Hub and Revive Success Training is a Sales & Marketing Specialist a Trainer, a Speaker, a Positive change maker. Since completing her Bachelor of Communications in 2003 she has worked at award-winning marketing agencies, consulted to small business owners and NFPs, run a franchise of Aussie Farmers Direct, founded Revive Success Training and has just launched the Holistic Business Hub, a beautiful and calming venue for hire where holistic practitioners, business professionals, and soulpreneurs can host their own events, a space where people can teach, learn, collaborate and grow. Her personal vision is for every person to love the life they live. And her mission is to cause global transformation by inspiring every person to be extraordinary. This may sound idealistic and one may ask; how can a marketing specialist achieve these goals? The answer; helping those that help others. In her workshop Anna will be asking the question: Have you ever wanted to authentically, work less and charge more but lack the confidence to do so? Anna has found that when you get the clear step-by-step direction you need. You break through overwhelm and turbocharge your success. She will teach you strategies that you can implement into your small business practice that will give you the clarity you need. So, stop missing out on time with loved ones, doing the things you love because you can't afford them and start living your life to the fullest.